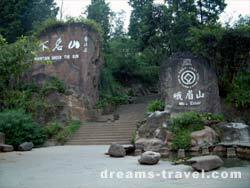 Mt.emei is blessed with clouds Sea, Sunrise, Buddhist halos, Saint Lamps -- these four great spectacles. 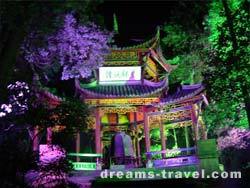 The central clustering ridges and peaks, wreathed with thin mist, jade green, spurting waterfalls, twittering bird, and the fragrance of flowers, give Mt.Emei the reputation of our country’s famous scenic spot for tourists. 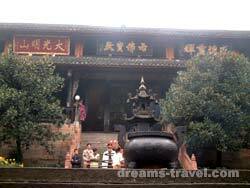 Furthermore, the site also contains ancient Buddhist temples, thus Mt.Emei is one of four famous Buddhist Mountains in China, and known as the place of Buddhist Rites of Puxian (Samantabhadra bodhisattva). 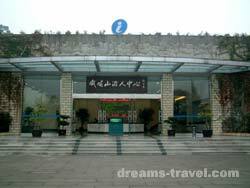 Generally speaking, there are some beautiful titles of Mt.Emei, such as Kingdom of Plants, Paradise of Animals, Geological Museum, and the Buddhist world.